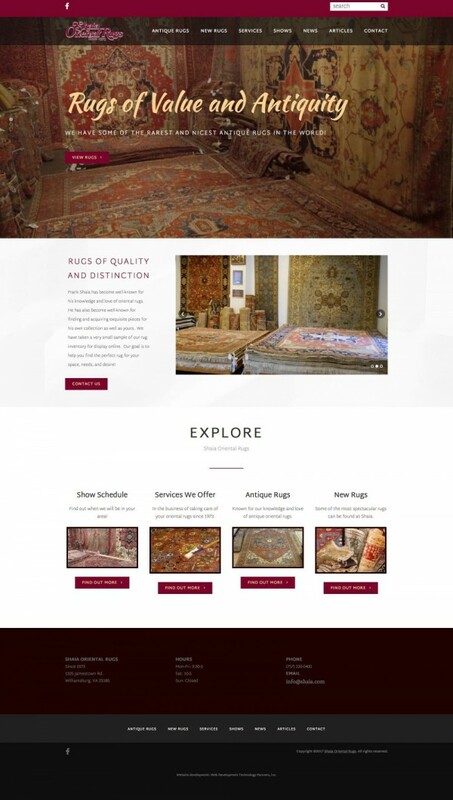 Shaia Oriental Rugs 2017 - Web Development Technology Partners, inc. Developing websites for 21 years in Williamsburg, VA.
Frank Shaia has become well-known for his knowledge and love of oriental rugs. He has also become well-known for finding and acquiring exquisite pieces for his own collection as well as yours. We have taken a very small sample of our rug inventory for display online. Our goal is to help you find the perfect rug for your space, needs, and desire! "To develop a great website you need people that truly understand all aspects of web design. The team at wdtp web development undoubtedly understands web design. Your understanding of our needs and your talent and creativity has resulted in a great product." © 2019 Web Development Technology Partners, inc.